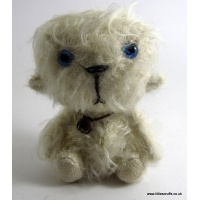 Welcome to the home of Little Scruffs full of small collectable miniature mohair artist bears, dogs and animals. Please take your time to look around at my current collection of mohair animals for sale which you will find on the left hand side under "Shop Online". Don't forget to click on the photo to enlarge. You can also see ones that I have made in the past by visiting my Gallery of Sold bears along the top of the page. The Way of the Bear book , full of Little Scruffs and delightful quotes, is available through Amazon in book or Kindle form. See details under Shop online, Bear Book,. If you would like any other information please feel free to contact me and I will do my best to answer any questions you may have. Thank you to my collectors, some who have become very good friends, for allowing me to do what I love most. The basic miniature bear making courses which are covered over 2 days are on hold for the time being due to various reasons beyond my control. I will let you know if they are resumed but meanwhile can probably put you in touch with other bear making classes that I know of. I love to know your favourites - traditional bears, Fat Heads, Soldier Bears or cute dogs, giraffes etc- so please let me know what you think. 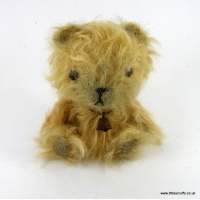 Remember - there is always room for one more miniature bear! !